HOW much room is there within the premium segment? Infiniti is about to find out. The luxury offshoot of Nissan entered the Australian market in September last year and has been busily building brand presence. Advertising at airports and supporting the Cirque du Soleil production have formed part of the launch strategy. The new dealership in Brisbane's Fortitude Valley is significant in Infinity's intentions. Sitting squarely among BMW, Mercedes-Benz and Lexus, Infiniti's plush new digs look the part and so does its cars. While the FX sports utility vehicle will be the volume seller, the M Sedan will also play a vital role in garnering attention. Our test was in the range-topping hybrid which will set you back about 100 grand - plus on-roads. There is little doubt you're in plush surrounds once you take a seat. Fit and finish is unquestionable, and there's a greater personality about the internal design rather than just adopting the company blueprint. While armed with a touch-screen to control the stereo, sat nav and other functions, there are a lot of buttons. The climate controlled air con settings are at the top of the sculpted dash while sitting lower is the stereo and sat nav operations. The double bubble on the gauges hood reminds us of the Peugeot RCZ back window, but works cohesively with the cabin's swooping lines. Two bottle holders are available centrally up front, while there is also a deep centre console with a handy spot for phones. Once underway the ambience is refined and quiet, not quite the silence of Lexus standards but better than some of the Europeans. There is little to complain about in terms of head and leg room, front or back, although back legroom is impeded by the transmission tunnel. Seats are nicely supportive, and the front pair have heating and cooling functions - although the controls take some close analysis. This is one quick piece of gear. It holds the title of world's fast accelerating hybrid with a 0-100kmh time of 5.5 seconds. Armed with a Lithium-ion battery pack that powers a 50kW electric motor and a 3.5-litre V6, the M can run solely on either, or a combination of the two. There is no need to select the power source, everything is done for the driver seamlessly. When the electric motor takes control your revs drop to zero and you can cruise for a couple of kilometres purely on battery power as long as there is no rapid acceleration required. It even works at highway speeds. When the petrol engines fires back to life you can feel some small driveline shunt, it's not major, just not quite as smooth as the Lexus equivalent. There are several drive modes, including "eco" which encourages smooth driving so much that the driver receives feedback from the accelerator pedal if their right foot is too heavy. Attack the corners and the M feels well balanced with good feedback through the steering and the seven-speed automatic box always manages to find the right cog. Given it's the range-topper, the M35h gets all the fun trinkets. The best stuff some the complimentary list includes a power sunroof, cornering Xenon headlights, auto wipers and lights, Bose stereo, hard drive satellite navigation, leather trim, keyless entry, 17.5cm colour touch-screen along with Bluetooth phone connectivity and audio streaming. There is also a full suite of safety gear that incorporates the givens like anti-lock brakes and stability control, but also radar cruise control, lane departure warning and prevention as well as forward collision warning. 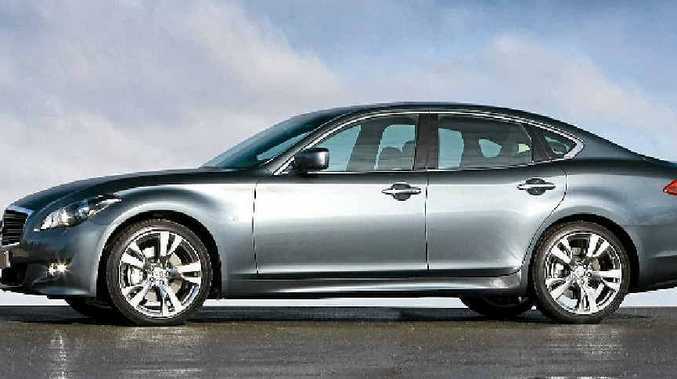 The main rivals in the hybrid are the Lexus GS 450h Luxury ($99,900), BMW Activehybrid 5 ($122,900), while other fuel efficient diesels worth considering are the Jaguar XF 3.0D Premium Luxury ($112,500), Audi A6 3.0 TDI ($116,500) and the Mercedes-Benz E350 CDI ($136,485). We achieved fuel consumption of 7.8 litres/100km on our test - slightly higher than the official figure but not far from it. The M is aided by a range of aerodynamic enhancements, and when combined with the hybrid technology it's a pretty thrifty unit. Resale values are still somewhat of and unknown, while it would be worth researching insurance and servicing costs before buying. Four adults can be accommodated in opulent comfort, five at a stretch. The greatest issue is the narrow boot opening and trunk space, which is restricted due to the batteries positioned behind the back seats. During our test, there were wide and varied onlooker comparisons. Hyundai, Maserati, Jaguar…the M35h has some beautiful lines. Bulging wheel arches look cool from the driver's seat, and the back end looks every bit the prestige offering. The good stuff: Cabin design and finishes, acceleration, features list. What we'd like to see: More boot space, smoother changes between battery and engine power. Warranty and servicing: Four years. Servicing is at 10,000km or every six months. Generous roadside assistance program with provisions for accommodation, accident coordination, alternate vehicle supply. Details: Four-door large rear-wheel drive luxury sedan. Engines: 3.5-litre hybrid, V6 producing 225kW @ 6800rpm and 350Nm @ 5000rpm with electric motor (and lithium-ion battery pack) that produces 50kW @ 1700 rpm and 270Nm @ 1770rpm). Transmission: Seven-speed automatic transmission with Adaptive Shift Control and manual shift mode with Downshift Rev Matching. Performance: 0-100kmh in 5.5 seconds. Bottom line: $99,900 (plus on-roads).